Calling In True Love | Blog: Rituals & Spells: Love, Protection and Health! This spell relates to the ancient symbol of the rose, in order to carry out your willingness to welcome a worthy and true love into your life. To ensure that love pours into your life, choose red roses with abundant rose petals, as they are used in this spell to create a path of love, which will bring true love to you and carry it over the threshold of your heart and home. Waxing moon, which makes stronger what we want.. The best day to do the spell is Friday /after sunset/, the day of Venus. 1. Make a protection. Visualize big circle surrounding your entire house. “This water, holy source of purity, carries the blessing of the goddess, Venus, within it. 4. Take 3 petals out of the bowl and take the rest to your front door. 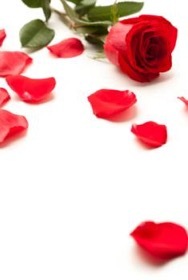 Lay a trail of rose petals from the doorway to your bed. 5. Thread the needle with the red cotton thread pierce the 3 remaining rose petals through the needle, in order to make a pendant. Wear the pendant around your neck throughout the whole night and then keep it under your pillow for the duration of the waxing moon. 6. Lay the pendant, your lucky charm, in a natural body of water and then you can expect your true love to appear in your life.